Sorry I’m late getting this to you today. I’ve been busy mixing and getting things ready for tomorrow. 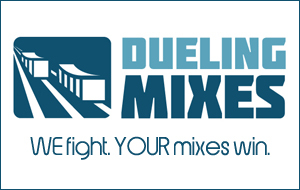 It’s the first of the month, which means all new multi-tracks, tutorial videos, and other goodies over at Dueling Mixes. What’s that? You haven’t checked it out yet? You really should. I think you’d love it. Anyhoo…I had an interesting “ah-ha” moment this week. I discovered something really interesting. You would think that using entirely different EQs and compressors (on the mixer itself), very few plugins, and an entirely different workflow/process would yield a pretty different result, right? You would expect my mix to sound different. If not night-and-day different, at least noticeably different. But that hasn’t been the case, and I’ve mixed several songs this way now. These mixes still sound like they were mixed by me. They sound like Joe mixes, both good and bad. As it turns out, you can change the equipment, but you can’t change the guy. My mixes still sound like my mixes, even on a very different system. That can only mean one thing: To improve my mixes, I’ve got to improve ME.